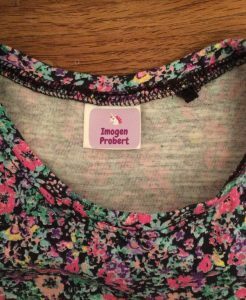 When Petit Fernand approached me and asked me to try out some of its personalised clothing labels, my initial thought was that I probably don’t need name labels for an almost two-year-old child. Those sorts of things are for children who are going to school, surely? But I was wrong. It turns out it is very useful to have name labels for a toddler. Mostly because they leave their stuff EVERYWHERE! First and foremost, I labelled the J’s shoes, coat, hat etc. for when I take her to the childminder. That way, if something gets left behind (likely) or taken home by someone else by mistake, it is obvious who it belongs to. Those readers who know me well might be aware that I can be a little bit possessive about my things (and now the J’s things). It stems from lending people rubbers and pencils at school and then never getting them back. I like to know where my things are and I get very stressed when I can’t find something or lend something and don’t get it back within a reasonable time frame. Labelling the J’s clothes reminded me of when I was at university and I decided to put a little blob of pink nail varnish on the underside of the handles of my saucepan set. In the second year, one of the girls I lived with had a very similar set. When we moved out and were sorting out our belongings she was adamant that a particular saucepan was hers. She could be very persuasive and I almost gave in to her when I remembered my nail varnish. I looked underneath the handle and low and behold there was a little blob of pink. Ah ha! I very smugly took back my saucepan. So, I was pleased to be able to indulge my mild-OCD habits by labelling most of the J’s clothes and shoes. 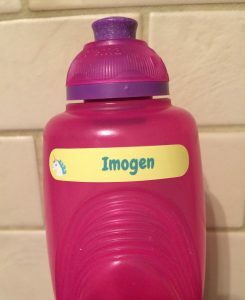 I also realised part way through the labelling-fest that I also had some ‘item’ labels too, so I have now labelled all of her drinks bottles and cups – again useful at playgroup when most of the kids have similar cups. 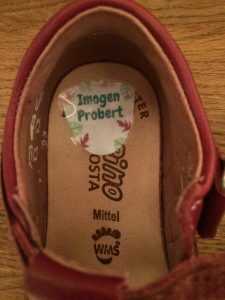 I also think that name labels are a good tool for the J, because every time she has a drink, gets dressed or puts on her shoes, she is looking at the label and seeing her name. Plus, the picture and bright colours catch her attention. While she is far too young to start learning to read, it can’t hurt to get her used to seeing her name written down. I also lent a bag of baby clothes to a friend the other day and rather than write out the J’s initials on the washing label of each item, I just stuck on a name label. It saves any awkward conversations when the time comes to return the clothes and you aren’t sure who lent you which items and what belongs to whom! I tried out the starter value pack from Petit Fernand, which gave you a mix of stick-on labels and iron-on labels. Both types were quick and easy to apply. 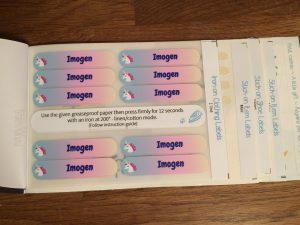 The starter value pack has 20 stick-on clothing name labels; 20 iron-on clothing name labels; 10 stick-on item name labels; 10 stick-on shoe labels; and 20 stick-on item name labels. My favourite thing about these labels was that they could be personalised with a small image (we chose a unicorn obvs!) and then different colour schemes and patterns. I designed these for the J, but it would be fun to do this with an older child – giving them a say in the image and colour choices. My only criticism was that while you could change the colour scheme and pattern, you could only choose one image for each different label in the starter pack.  It would be nice to be able to choose 4 or 5 different pictures to go with the different designs as there were so many cute ones to choose from! Having used these labels for a couple of months, they have lasted well and retained their ‘stick’ – they haven’t faded at all. At £22 for 80 labels the starter pack is excellent value for money and gives you everything you need for one child. 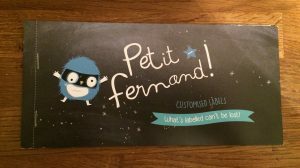 Petit Fernand also sells packs for nursery, school, holiday camps/school trips, as well as personalised water bottles and lunch boxes. Disclaimer: I was given a starter value pack of labels from Petit Fernand in return for writing an honest unbiased product review.